While listening to my favorite radio show, the Jim Rome Show, I heard the commercial for Ciao Bella Italian Grill and its sister restaurant, Carmela's Caffe. Even though it wasn't the first time that I heard about it, the commercial coincided with my lunch time so I decided to give Carmela's a try. In searching for Carmela's, located in the Erin Way Shopping Center on Erin Drive near the intersection of Poplar and Mendenhall, was a little hard to find at first, especially with the place lacking any outside signage other than the small sign displayed below the bigger shopping center street side sign. Eventually, I realized that Carmela's is a café within Ciao Bella and consequently found it, and was rewarded for it with a great meal. After seating myself at a table, I looked over the menu to see what I wanted. Carmela's serves mostly sandwiches and pizzas, with a smattering of other items like pasta. 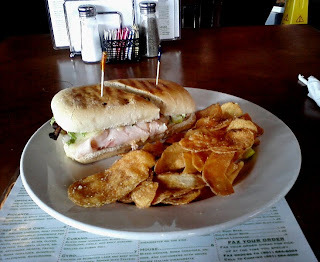 While reviewing the menu, I remembered that the blog Hungry Memphis and a foursquare user recommended the Marco Polo panini, a hearty ciabatta bread sandwich filled primarily with a lot of Mortadella ham. Along with other ingredients like mozzarella cheese and balsamic viniagrette, the taste is very light, in the sense that I got a good feel of the flavor without being overwhelmed by any particular element. The texture of the ham was very tender, so much so that I thought that I was eating a turkey sandwich at one point. Also, for those who are sodium conscious, I only detected a slight taste of salt, just enough to pleasure the taste buds. 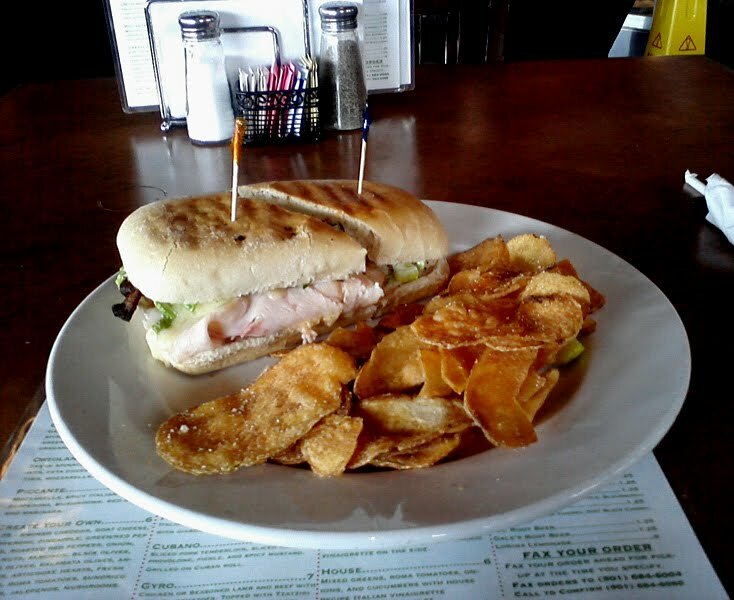 In all, the panini, along with the homemade potato chips and a Bud Light (a nice complement for this sandwich), was very satisfying both in quantity and in taste. If Carmela's other paninis and sandwiches are as good as the Marco Polo, I look forward to trying them out in the future. On my second visit, I decided to go with a pizza because I wasn't nearly as hungry as before. After looking over my options, the Ortolana pizza looked very appealing to me so I ordered it. 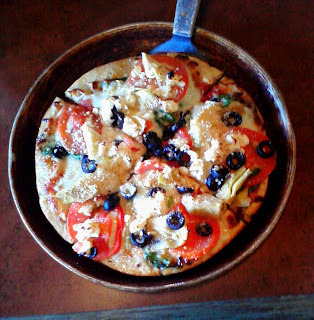 The pizza is a thin crust that measures about eight inches in width (this size applies to all of Carmela's pizzas), featuring the toppings of fresh spinach, artichokes, black olives, feta cheese, sliced roma tomatoes, mozzarella, and marinara. Of all the toppings, the artichokes, black olives and both cheese stand out in regards to taste, with the other toppings accentuating them. By the way, there isn't a lot of marinara on the pizza, as far as I could detect by both eyeballing and eating it. Overall, the pizza hit the spot and I was satisfied with it. As for the other items on Carmela's menu, I believe that there isn't a bad choice on the menu, based on what I had. The Gourmet Burger, which primarily consists of grilled Black Angus beef that's lightly seasoned, Mozzarella cheese, sautéed red onions and Portabella mushrooms, lettuce, tomatoes and balsamic herb mayo on a toasted ciabatta roll, has a taste that seemed very light to me. What I mean is that the beef lacking seasoning, and nothing else came to the fore that resembled flavor. 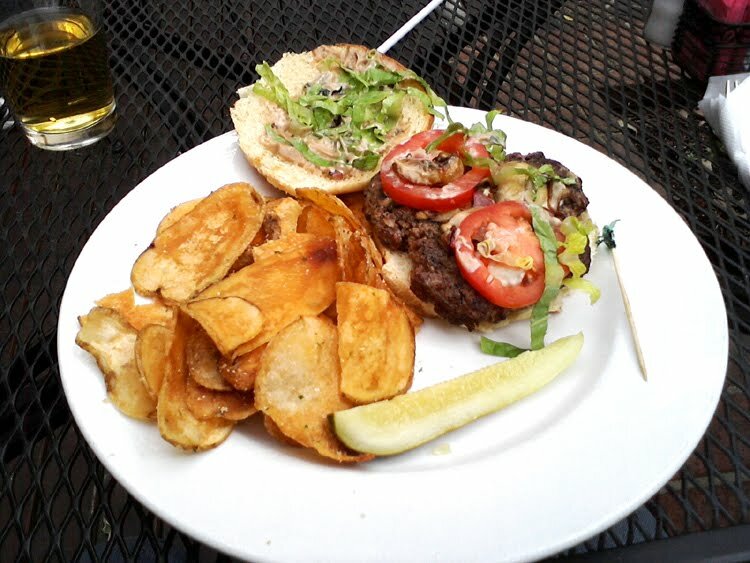 However, the burger isn't "filling" and, along with the homemade potato chips, provided just enough to satisfy my appetite. 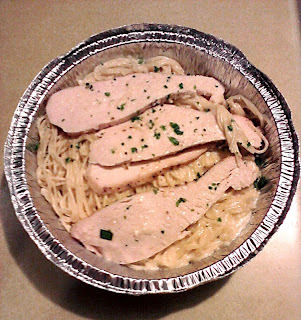 As for the pasta, I tried the chicken alfredo with angel hair pasta (Carmela's also offers the option of penne pasta with this entrée). The alfredo sauce is thick and buttery, mixed with chopped parsley and what I believe to be garlic (it's aroma in this is very strong). 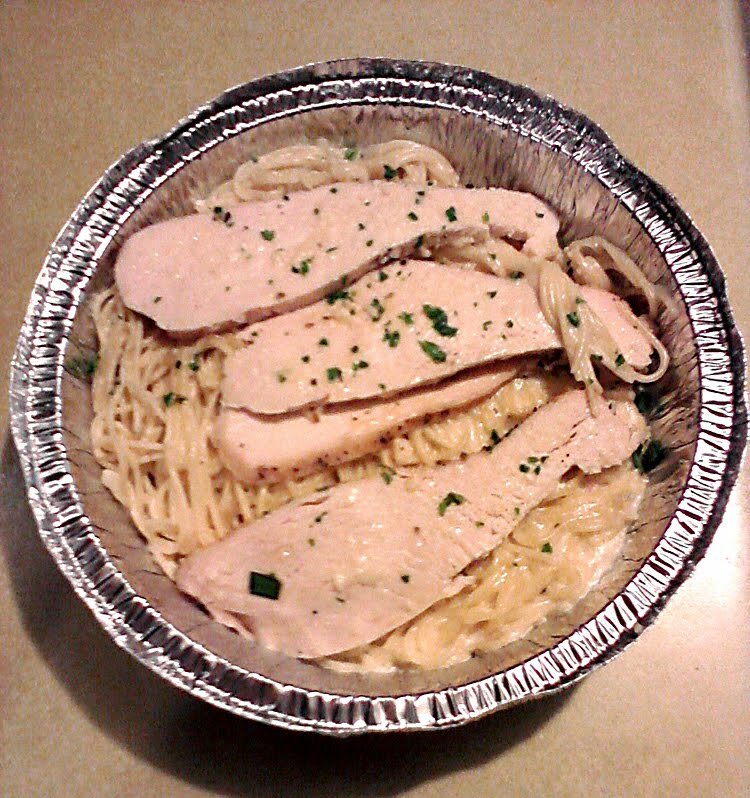 Combined with the strips of chicken breast, the taste is great and left me wanting more. Overall, I was really impressed with my experiences at Carmela's Caffe, for the food is excellent and the restaurant staff is very attentive. Even though I don't visit East Memphis often, Carmela's will definitely be on my short list whenever I'm in the area and hungering for lunch. With Carmela's being an extension of Ciao Bella, I will certainly be making a dinner visit some time soon in the hopes that the quality of the food and service that I experienced at Carmela's carries over.